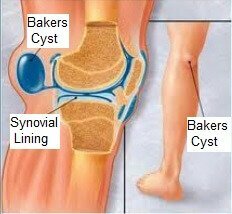 A Bakers Cyst is the most common cause of swelling, pain and stiffness behind the knee. At the back of the knee is the popliteal bursa - a small fluid filled sac that sits between the hamstring muscle tendons and knee bones to reduce friction. Inflammation of this bursa was first discovered in the 19th century by Dr William Morrant Baker, which is where is gets the name Bakers Cyst. It is also known as semimembranosus bursitis or a popliteal cyst. Popliteal cysts are most common over the age of 40 and tend to affect women more than men. Here we will look at the causes and classic symptoms of a Bakers Cyst, the best treatment options and how to prevent the inflammation from returning in the future. What Causes A Bakers Cyst? A Bakers cyst develops when there is excess fluid in the knee joint. A number of things can cause this swelling of the knee. The most common is osteoarthritis, where wear and tear of the knee bones and cartilage leads to increased fluid in the knee joint. In fact, 50% of arthritis sufferers develop a popliteal cyst at some point. Other conditions, such as gout, or any injury to the knee which produces swelling, e.g. a cartilage tear, can increase the risk of developing bursitis. Excess synovial fluid seeps backwards out of the joint and into the semimembranosus bursa. As the fluid enters the bursa it starts to swell resulting in bursitis. The first symptom people tend to feel with a bakers cyst is a small bulge behind the knee, a bit like a small water balloon or squashy orange. There may only be minor swelling and often a popliteal cyst is so small you don’t even notice anything. In some cases however, the cyst can get quite large, resulting in pain behind the knee, tightness and stiffness, especially when you bend and straighten the knee. The average size of a Bakers cyst is 3cm. The pain associated with a popliteal cyst tends to get worse with activity or when standing for long periods, easing with rest. Diagnosis of a popliteal cyst is usually made by your doctor from what you tell him and what he can see. If there is any doubt the doctor can confirm the diagnosis of a Bakers Knee Cyst by performing an ultrasound or MRI scan. The symptoms of a ruptured popliteal cyst can be similar to those of a DVT (a blood clot in the leg). If you experience pain in your calf accompanied by any swelling, redness or heat, see your doctor immediately. Ice treatment helps to reduce the swelling in the knee and the bursa, which will help to reduce the pain. In the ice wrap section we look at all the different ways to apply ice and which ones are most effective. Non-steroidal anti-inflammatory Drugs (NSAIDs) e.g. ibuprofen can help to reduce pain and swelling with popliteal bursitis, but they should only ever be taken on advice of the doctor due to the potential side effects. Tightness in the muscles around the knee aggravates a Popliteal Cyst by squashing it which can lead to further inflammation. Knee stretches can therefore be a very effective way of resolving the condition. In the Bakers Cyst Stretches section we look at the best exercises to reduce the pressure behind the knee which helps to both treat and prevent further episodes of popliteal bursitis. If a bakers cyst is particularly large or is causing pain behind the knee, then the excess fluid can be drained with a needle by your GP. It is a very simple procedure and usually provides instant relief. However, it is very common for the fluid to re-accumulate in the bursa if the underlying cause of the bursitis is not address – see Preventing Recurrence below for tips on how to avoid this. Knee bursitis often responds well to cortisone injections. This is where your doctor injects a mixture of steroid and local anaesthetic into the knee which works to reduce the swelling and reduce the pain behind the knee. Again, the benefits are usually fairly instant but are often short lived as the swelling returns. Pulsed electromagnetic energy, aka short wave diathermy, is a form of electrotherapy can help to reduce the inflammation. PEME is usually carried out by a physiotherapist. It can take a few sessions to notice the benefits but I have certainly found this to be an effective treatment with a number of people suffering from a bursitis. Bakers Cysts frequently return, especially in people suffering from arthritis due to the continued production of excess fluid in the knee joint. Knee strengthening exercises and knee stretches can often help to prevent a popliteal cyst returning. The stronger the muscles get, the less force goes through the bones making it less likely that the knee will swell which therefore prevents another knee cyst from developing. This is especially the case when the popliteal cyst has developed due to knee arthritis. Occasionally, a Bakers Knee Cyst bursts. The fluid from inside the bursa typically leaks down the back of the leg and into the calf area.This can cause swelling and/or a sharp pain in the calf. The free fluid will gradually be reabsorbed into the body but this can take up to a month. Pain medication can be used to alleviate any discomfort after the cyst bursts. 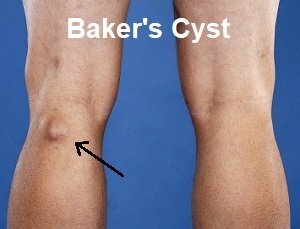 Where Does The Name Baker Cyst Come From? 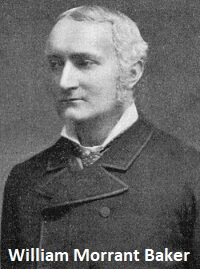 A Baker’s Cyst gets its name from the surgeon who first wrote about the condition, Dr William Morrant Baker (1838-1896). He was an English physician and surgeon. A baker cyst is also known as a popliteal cyst. It is a fluid filled cyst found at the back of the knee. Is a Baker’s Cyst Dangerous? Whilst it is uncomfortable, a Baker’s cyst is typically not dangerous. It is caused by excess fluid in the knee being pushed out into a small sac called a bursa. This then grows to the point that it is visible on the back of the knee. What Causes A Baker's Cyst To Burst? Excessive swelling or pressure on the bursa can cause a Baker's Cyst to burst. When a Baker's cyst ruptures, the fluid seeps down into the calf causing a sharp pain in the calf. The calf may also become red, swollen and tight. A ruptured popliteal cyst can be extremely painful. Is Draining A Bakers Cyst Painful? If a bakers cyst is extremely painful or persistent, your doctor may want to drain the fluid with a needle. It is a fairly painless procedure – just a slight prick as the needle penetrates the skin. You may also be given a steroid injection to reduce swelling. In some cases, the fluid returns. How Do You Get Rid Of A Baker's Cyst? To get rid of Baker’s cyst, there are ways of reducing the short term pain including using ice and anti-inflammatory painkillers. To avoid recurrence, strengthening the muscles around the knee is important. Stronger muscles mean less force is put through the bones thus reducing the likelihood of swelling and the cyst returning. There are other causes of swelling and pain behind the knee besides Bakers Cyst knee. Visit the knee pain diagnosis for help working out what is causing your knee pain.